The spirit of democracy cannot be a gift; it cannot be obtained by wishful thinking or by outright purchase. It is a quest; a pursuit of enlightened imagination. It is born in the natural rights of all humankind; it is nurtured in a civil public discourse; it finds expression in the virtues of how we live together. 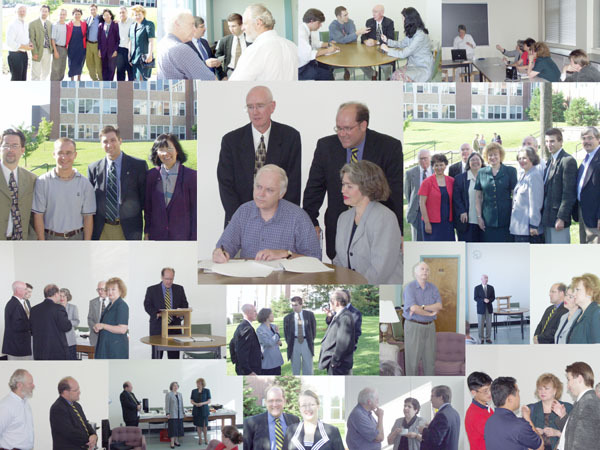 The project got under way formally with a ceremony and celebration held at the University of New Brunswick in July 2000. Participating were the Russian and Canadian members of the Steering Committee, as well as Canadian members of the development team. Signing a collaboration agreement is Dr. John McLaughlin, Vice-President of the University of New Brunswick. Looking on are the project co-directors Andrew Hughes and Natalia Voskresenskaya, as well as the Honourable Andy Scott, Member of Parliament, representing the Government of Canada.